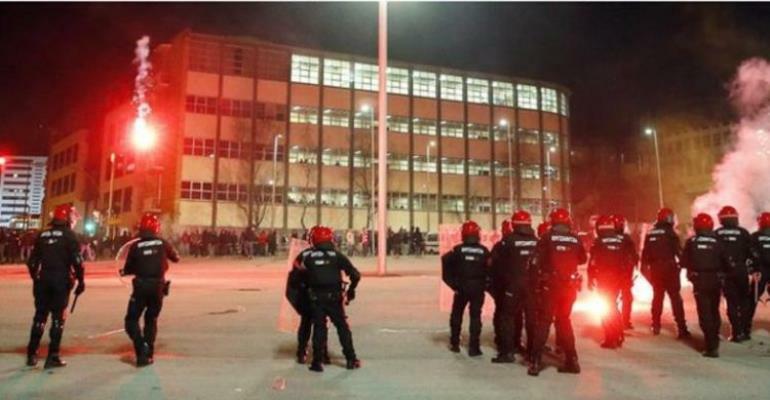 A police officer has died in Spain after violent clashes erupted between rival fans before Athletic Bilbao’s home Europa League match against Spartak Moscow at San Mames. The officer from the Ertzaintza – the Basque Country’s police force – reportedly suffered a heart attack. More than 500 officers were deployed for the tie and reports say at least five arrests were made. Spanish Prime Minister Mariano Rajoy has condemned Thursday’s violence. The police officer, who was named locally as 51-year-old Inocencio Alonso García, collapsed while intervening in street clashes involving Russian “ultras” from Spartak Moscow. He was taken to the hospital, where he was later reported to have died, Spanish news agency Efe reports. Several people had arrived “prepared for the altercations” carrying weapons including extendable batons and knives, the police said. The clashes came on the same day a Russian, wanted for attacking an England fan during the Euro 2016 riots in Marseilles, was arrested in Munich while travelling to the match in Bilbao. Despite the violence, the game went ahead and Spartak won the second leg 2-1 but Athletic went through 4-3 on aggregate. Mr Rajoy offered his condolences to the family and friends of the policeman. “My appreciation to Ertzaintza, for their efforts to protect those who know how to enjoy the sport,” he tweeted. Bilbao police also paid their respects to the officer. “Our condolences to colleagues, friends and relatives of the Ertzaina who died in active service,” the force said in a tweet. The La Liga club also offered their condolences to the deceased officer. European football’s governing body Uefa said it “strongly condemned the violent clashes”.